Thursday, July 29th and Friday, July 30 at 8:30 pm. Admission $10 for adults, $5 for students, seniors and children. 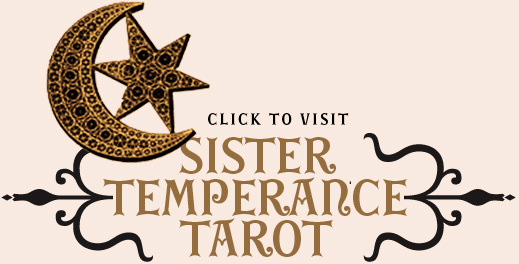 and patron saint of madhouses, motherless children, and princesses in exile. 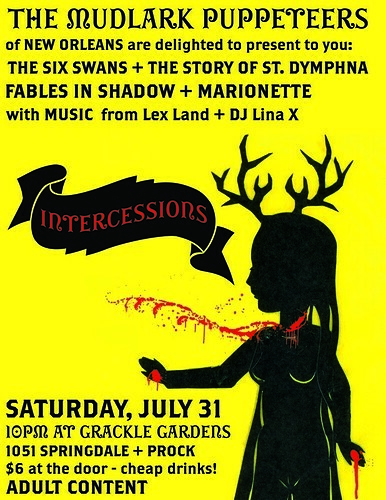 Told through rod and shadow puppetry – to a score of very black metal. and The Six Swans – from the Brothers Grimm. brothers from a cruel witch’s curse. Told in rod and shadow puppetry. 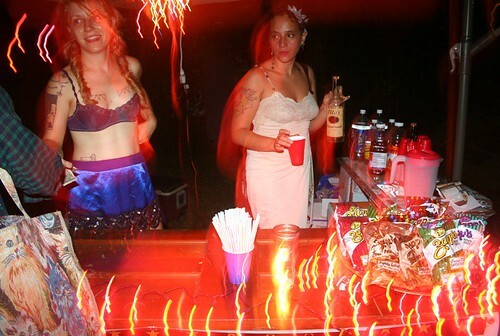 and DJ Lina X spinning into the night for dancing under the trees! 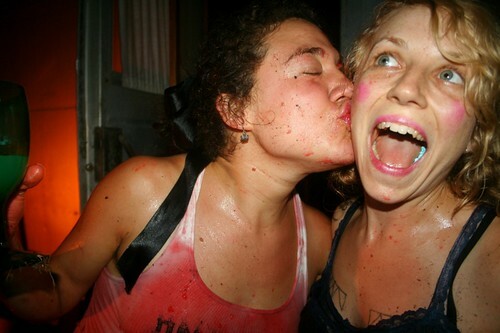 party, with live bloodwrestling, which was quite a hit, as you might imagine. Sick, as carny-barker presents the bloody spectacle, with Zibby, Frannie and Marrow wrasslin’ to the death! Analy and Rachel tipped the pool over with their exertions! with applejack cocktails that enabled and inspired much of the wrestling! 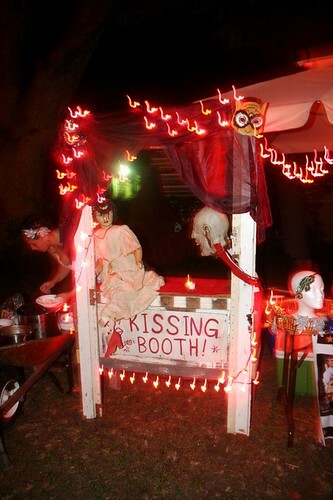 The bartenders did double time at the kissing booth. Lovely Monika wielding sparklers in her fanciest underthings. 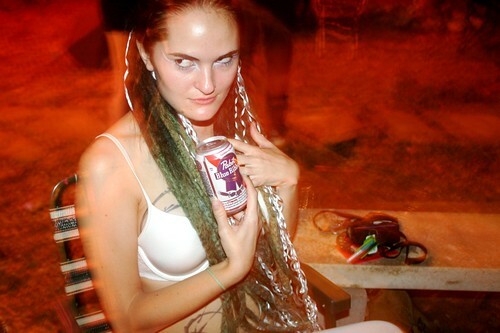 The lovingly cradled PBR was merely a prop to display her talent for showcasing. palace, to please the Emperor, but can nature’s beauty thrive in a gilded cage at court? Waiting for Gumbo was hysterical. 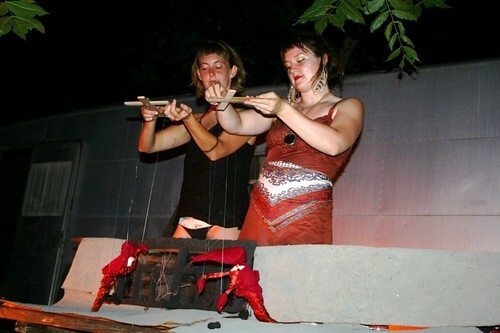 Beckett’s Godot performed by crawdads, mice and live cockroaches! Miss Amelia, radiant and lovely, and wearing only her unmentionables! I don’t remember this chicky’s name, but I like her Aeon Flux hair-do. Elves, I tell you! Amanda Stone is made of elves, and don’t let nobody tell you different. 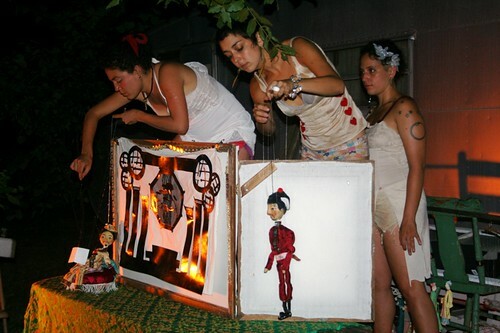 See the full set of The Black Forest Fancies Underpants Party photos here!